It’s generally a pretty safe assumption to say that if your team allows 3 goals or less, it has a pretty good chance of winning games in the NHL. For the New York Islanders, this proved to be a nearly impossible task as they only held teams below 3 goals just once in their first 11 games. The team managed to jump out to a decent 6-5-0 record by scoring 29 times in their 6 wins for an average of nearly 5 goals per game. In their 5 losses, they managed just 7 goals, putting their total goals over this 11 game span at 36. This average of 3.28 is much closer to the league average, and realistically where the Islanders can expect their season goals-for to be. Unfortunately what that also meant was that giving up 39 goals through the first 11 games was not very good. At a 3.55 GAA, the team was actually on the negative side of goal differential despite having a winning record. I’ve already explained why the Islanders defense struggled in this post. It wasn’t really a secret if you watched them night in and night out, they were simply missing assignments and playing dumb hockey. I’d love to sit here and pretend my analysis of the Islanders defensive struggles was pointing out something groundbreaking, but at the end of the day you know the coaches spent hours drilling these concepts into the skulls of every player on that team. Over this most recent winning streak, the Islanders have allowed just 6 goals in their last 5 games in topping their last 4 Western Conference opponents and the Florida Panthers. Before you point out the Panthers’ struggles, remember that 3 of those goals came from Florida, meaning the Islanders allowed 3 goals to the Ducks, Kings, Coyotes, and Avalanche. With 7-5, 6-3, and 5-3 wins on the season, the Islanders have shown that they have the ability to shoot their way out of trouble. Of course, that’s not the most effective way to win hockey games by any means, so by scoring 16 goals in their last 5 they’ve actually shown that they can handle winning low-scoring affairs. This not only signifies that the Islanders are actually good, but shows a level of maturity that they’ve lacked over the last few years. 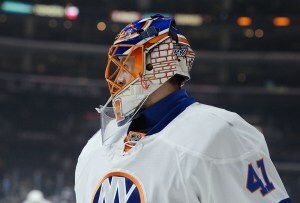 Halak has started in 4 of these wins, allowing just 5 goals and posting an absurd save percentage of .966. Of course, we can’t expect that to continue, but even when he drops towards his career average of .917 there have been enough promising signs from this defense that he shouldn’t need to stand on his head to get the wins. This defense is actually handling its assignments well, covering the slot, making the smart play and staying relatively conservative. They’re showing much more discipline than they were early on, when it seemed like they were counting on their high-powered offense to bail them out. Five straight wins was enough for the Islanders to get some separation in the Metropolitan Division, which is a huge deal when looking forward and seeing the next 4 games against the Lightning and Penguins (twice each). This is their chance to showcase their maturity, confidence, and skill to the NHL’s best.